The plan for today was to write while the sitter was here, but my daughter has morphed into a Stage 5 Clinger (credit: Wedding Crashers) and wants absolutely nothing to do with the sitter. She must be getting sick. She is jammed right up against me right now and has finally quieted down and stopped asking me to play with her. As I write this, my son just ran up and vaulted on to me. The clinginess is contagious. Gah. So this will be a short post. I just tentatively sold some throw pillows on the Facebook yard sale — I have to meet the person in a nearby town. Which is OK because we have to go out and run some errands anyway. I am extra motivated to sell because we bounced some checking account items, due to my husband’s dilatory (look it up) deposit, and incurred some fees. I’m basically trying not to think about it, because it was so dumb, and it was more than one fee. But in the interest of full disclosure I feel like I should report it here. Money in… money out. Reminds me of the time I broke down crying in my office at work, a few years ago, over two bounced check fees. Things were much tighter then, and to have that happen just pushed me over the edge emotionally. I don’t know why I don’t have overdraft protection. I guess I better look into it. In more happy news, I saved 33% this week at ShopRite, with $30 worth of coupons, plus digital coupons. I got two bottles of All detergent for $1.35 each, Speed Stick deodorant for $.50 each, and Colgate toothpaste for $.75. Campbell’s homestyle chicken noodle soup and chicken with stars cans were $1.12 each (regular price is $1.69). I can’t quit you, couponing! I also earned $13.50 back when I bought my contacts from 1800 Contacts.com through eBates. And I joined Swagbucks and am trying to figure that out — more on that later. The kitchen decluttering continues. 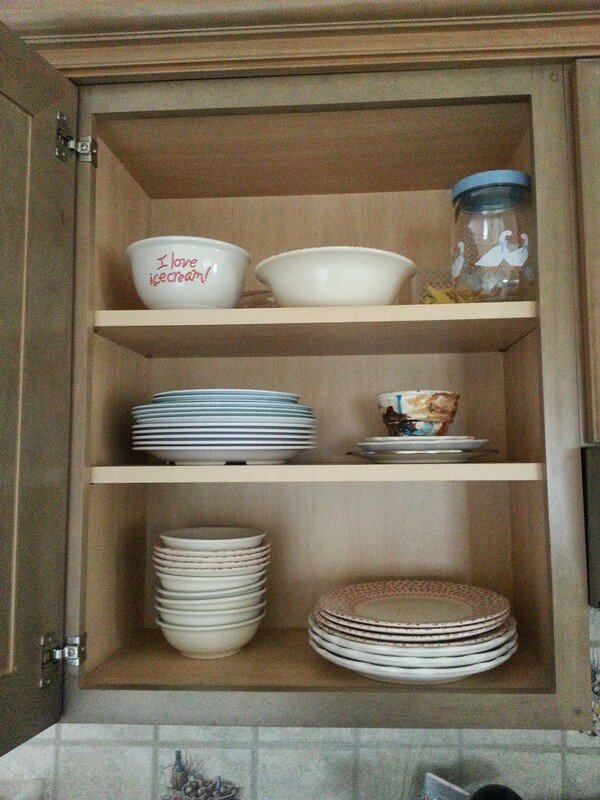 Things are really much better organized — I can feel the difference. I just have to do the glasses cabinet, then I will be done all the cabinets. Next up is the pantry — food items. And then I have to print the February calendar and see what room is next.